The 2015 IIHF World Junior Championship was a huge success for Hockey Canada. On the ice, Team Canada beat Russia 5-4 in the final to win gold. Off the ice, Hockey Canada, an Agility CMS customer since 2012, went into the tournament expecting big traffic numbers to their website. During international tournaments like the IIHF World Junior Championship, hockey fans across Canada and around the world visit www.HockeyCanada.ca to find information on Team Canada’s roster, game times and much more. HockeyCanada.ca smashed its traffic records during the tournament. Over the course of the 2015 IIHF World Junior Championship, from Dec. 26, 2014 to Jan. 5, 2015, the site broke its previous single-day high for daily page views four separate times. The Agility CMS-powered website, built in partnership with Point Alliance, was able to handle the huge spikes in traffic. 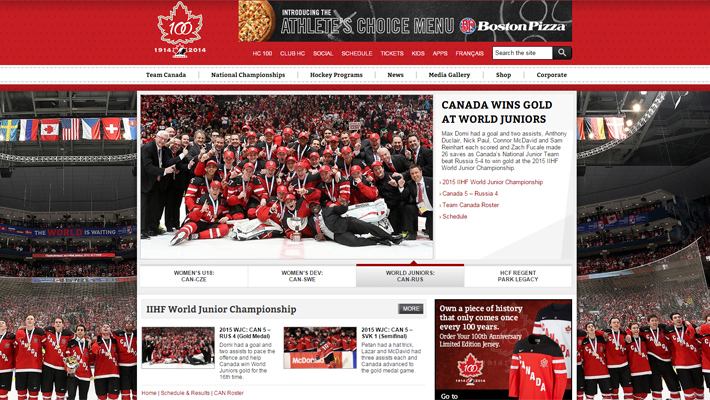 Hockey Canada had experienced issues with down time and poor performance using its previous platform, which led to finding a new CMS for its website. The brand required a flexible and secure platform with proven high performance. The Agility CMS platform stood out because of its ease of use, ease of development, robust capabilities and guaranteed up-times. The 2015 IIHF World Junior Championship is the latest success in a fruitful partnership between Agility CMS and Hockey Canada. The Agility CMS team is happy to work with Team Canada, and is looking forward to backing Hockey Canada during big events and tournaments in the future.